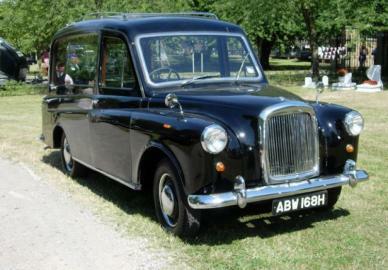 The FX4 was the successor to the Austin FX3 produced between 1948 and 1959 and in its own day regarded as the classic London taxi. Like the FX3, the FX4 was designed by Austin in collaboration with Mann and Overton (a taxi dealership) and Carbodies (a coachbuilder). The design team included Albert Moore from Austin�s engineering division, Jack Helberg from Carbodies and David Southwell of Mann and Overton. The original design was by Austin�s Eric Bailey with the assistance of Carbodies' Jake Donaldson. Little change was necessary to produce the outline of the production vehicle. The first FX4 was delivered in July 1958 with an official launch later that year. In 1982, Carbodies, who had been producing the FX4 for Austin for some years, took over the intellectual property rights in the FX4 and began to produce them under their own name. The old Austin engine was no longer available due to difficulties with emissions. The plant had been sold to India. Carbodies selected the Land Rover 2286cc/63bhp diesel engine in its place. The new model was branded the FX4R, R for Rover. The FX4R had some improvements over the previous FX4 models with power steering being available, which is detectable by small bulges on the base of the bonnet, and improved braking through servo assistance. The performance and reliability of the FX4R was however very poor. An alternative approach was the refurbishment of old chassis and suspensions and fitting of new bodywork and 2.5 L diesel engines made using the plant exported to India. Because the vehicles used refurbished chassis and suspension components, they were required to have a registration mark ending with the letter Q rather than the current year letter. They were therefore known as the FX4Q or "Q cabs". They lacked power steering but were substantially cheaper than an FX4R. These vehicles were produced by Carbodies but sold by the dealer Rebuilt Cabs Ltd. Some observers recognise the FX4W, which was available from early 1986, and enabled the FX4 to be wheelchair accessible, as a separate model. In this variant, the left rear door was made capable of opening 180� and the front/rear divider staggered. Wheelchair access could also be provided as a retrofit to existing vehicles. Its provision became compulsory in London in 2000 resulting in many older cabs retiring from London service, or "being taken off the plate", rather than incurring the expense of a conversion. In February 1989 the Fairway was introduced. It was fitted with a N/A 85 bhp (63 kW; 86 PS) 177 N�m (131 lb�ft) straight-4 SOHC 2664 cc Nissan TD27 diesel engine. This made the FX4 a faster and more reliable car. The braking system was perhaps not quite equal to the task, and a number of accidents occurred as drivers were unable to stop safely from high speed. Redesign of the braking system was not straightforward in view of the requirement of a London taxi to have a 7.6 m (25 ft) turning circle. In due course, GKN redesigned the brakes and suspension to allow disc brakes to be fitted at the front while maintaining the tight turning circle. The new brakes can be fitted to older FX4s by replacing the whole front axle very quickly and easily. This version, the Fairway Driver, was the last of the FX4s and the very final one made, with registration mark R1 PFX (i.e. RIP FX), was built on 1 October, 1997 and is now in the National Motor Museum at Beaulieu. Due to the imposed emissions regulations of recent years, various emission reduction kits were made available to get the engines to Euro 3 standard. These include the STT Emtec Clean Cab turbocharger system, Taxicat exhaust gas recirculation system and an LPG system. Taxi drivers seem to prefer the STT Emtec system as it can increase power and no effect on economy whereas the Taxicat system is not as successful and the LPG conversion a radical, more expensive and technical option affecting residual value. With only 80 Austin- and Rover-engined cabs plated during the emissions strategy of 2006 no company had successfully designed a kit for these owners, giving these few cabs an exemption from the control. The 15,000 Nissan-engined Fairway, Fairway Drivers, TX1 and a few Ford 2.5L-engined metrocabs however had to be converted as per the requirements of the strategy. Surprisingly. given this advantage, in late 2009 only six plated Rover- or Austin-engined cabs work the street, most having covered more than a million miles each. The Austin FL2 was the private hire version of the FX4 lacking the top-mounted taxi sign. It could also be ordered with upmarket trim and air conditioning for hotels and similar businesses to use as a courtesy car and was also sold as a private car.